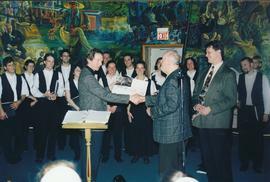 Len Enns (left) receives a sketch from artist Heinz Gaugel at the Behalt Mennonite Information Center in Berlin, Ohio. The Conrad Grebel College chapel choir is in the background. Gaugel painted the mural on the wall.